LAWRENCE — Evolutionary biologists long have supposed that when species colonize new geographic regions they often develop new traits and adaptations to deal with their fresh surroundings. They branch from their ancestors and multiply in numbers of species. 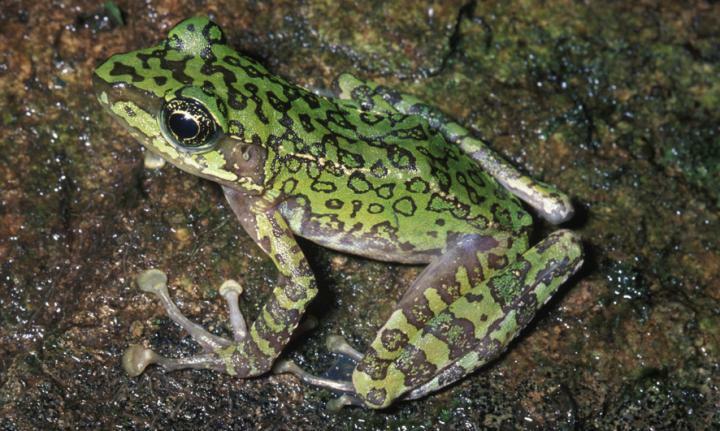 "First, we had to identify where these true frogs came from and when they started their dispersal all over the world," said lead author Chan Kin Onn, a doctoral student at KU's Biodiversity Institute. "We found a distinct pattern. The origin of these frogs was Indochina — on the map today, it's most of mainland Asia, including Thailand, Vietnam, Cambodia and Burma. True frogs dispersed throughout every continent except Antarctica from there. That's not a new idea. But we found that a lot of this dispersal happened during a short period of time — it was during the late Eocene, about 40 million years ago. That hadn't really been identified, until now." "That was our expectation," Chan said. "We thought they'd take off into all this new habitat and resources, with no competition — and boom, you'd have a lot of new species. But we found the exact opposite was true. In most of the groups, nothing happened. There was no increase in speciation. In one of the groups, diversification significantly slowed down. That was the reverse of what was expected." "Our conclusion is kind of anticlimactic, but it's cool because it goes against expectations," Chan said. "We show the reason for species richness was just a really steady accumulation of species through time — there wasn't a big event that caused this family to diversify like crazy."